This is Sinn's largest pilot's chronograph, and features Sinn's hardened black PVD Tegimented technology on both the case and the bracelet. 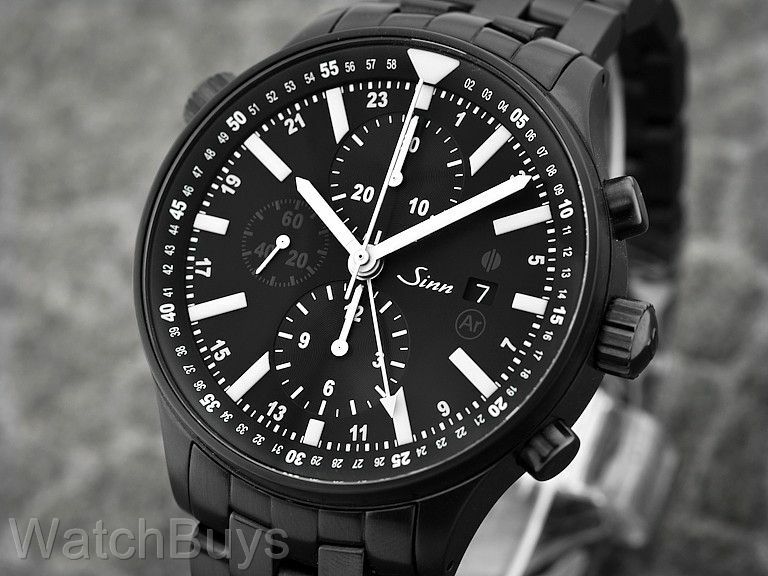 The Sinn 900 Black Flieger Chronograph is a variation of the popular Sinn 900 Instrument Chronograph, and features many of the advanced technologies pioneered in that watch. The differences lie primarily in the dial, hands and markings, which are of a traditional pilot's watch rather than an instrument watch. 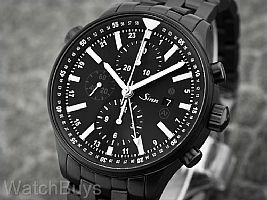 Sinn calls this model "Der groe Fliegerchronograph" with a case diameter of 44 mm, sapphire crystal, water resistant to 20 ATM and features a Tegimented PVD black bracelet. The dial is black galvanized, with clean, bold white hour markers. This watch also offers excellent visibility at night through the use of luminous hands and markers. The Sinn 900 Black Flieger Chronograph is a dual time zone chronograph, featuring two registers, sweep seconds, date and second time zone indications. Unlike most other Sinn dual time chronographs, this watch shows the second time zone as a 24 hour zone rather than 12, making calculations with AM and PM simple. This watch also features a rotating inner bezel activated through a crown at 10. This bezel is marked in minutes, and may be used to measure elapsed time for an event. This watch features Sinn's "Tegiment" technology. Standard steel used by most watch companies has a hardness of between 200 and 240 HV (Hardness Vickers is a common scale used to measure material hardness). The Tegimented steel has a hardness of 1,500 HV to which the PVD is applied with a hardness of 2,000 HV. The case back is nickel free, perfect for those with allergic reactions to case metals. Next, this case offers magnetic field protection of up to 80,000 A/m, among the highest for any mechanical watch. Magnetism can cause dramatic swings in the timekeeping of a mechanical watch movement. People are often exposed to magnetic fields without even knowing so frequent high altitude flying, metal detectors, audio and video equipment, medical equipment and computer equipment to name a few. "New Sinn 900 all BLACK"
Verified Owner Comments: Its been several weeks now the watch has been on my wrist. When I look at the time and watch, all I can say is that I made the right decision and I should have gotten it sooner. The fit ,feel and weight of the watch is good for me. I my line of work, im constantly timing products. The second hands are really easy to read . I also use the elapse time inner rotating bezel. The adjustment hand at 10 oclock position is easy to use and smooth to adjusting. I also wake up at nights to check the time for early conference calls and have no problems with the luminous dials. On the 900, the luminous markers are large and they jump out. Sinn, what is there to say. Its there always when you need a real watch.